It doesn’t matter one whit what size room you’re furnishing but it’s especially smart when your space is small. Small chests make great side tables in the bedroom or living room. A small chest is a good place to store books, magazines, and that remote control that’s forever getting lost. Place a small chest by your front door, hang a mirror over it, add a small lamp and you’ve created an attractive and useful entryway. A basket for mail could sit on top. Mittens, hats, keys, maps, etc. can be stashed in the drawers for use when you need them but out of the way when you don’t. A relaxing bedroom retreat is on everyone’s wish list, right? Nearly every decorator or designer recommends that the very first room you should complete is your bedroom. It’s your sanctuary…the place to go at the end of a long day. It’s where you regroup, relax, rest and it’s all yours…a private retreat. Unfortunately, it’s usually the last room we decorate because it’s a private area and we want our public areas decorated, first. We need to change our thinking about that! I don’t know about you but if my bedroom is disorganized it’s not a retreat and I can’t relax. So organizing that space is pretty important. 1. Start with the closet. A small bedroom is difficult to organize especially if it’s shared by two people. 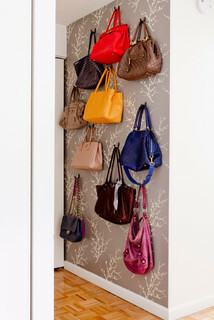 You’ve got double everything…clothing, shoes, accessories and finding space in a small space can be frustrating. If you’re just moving in, you’ve probably already done that but if not…now’s the time. Decide what kind of storage system will work for you so you don’t buy boxes and bins that won’t work. Measure the space. That’s important when you go shopping for any organizers or shelving systems. How much closet space do you need for hanging clothes? Do you have more short items like shirts and pants or longer items like dresses and robes? Do you need shoe storage? There are hanging shoe bins which work well. I have one in my master closet. I love it because I can see all my shoes at a glance. Shoe shelves that sit on the floor are great, too. Most closets have enough room above the shelf in the closet to install a second shelf higher up which is perfect for out of season clothes packed in bins or blanket bags. Or suitcases. Which Closet System Fits Your Needs? You’ll get more bang for your buck with a really good closet organizer. I absolutely recommend getting one for each closet. This one is a beauty for a small closet. It’s by ClosetMaid and it’s available on Overstock.com. It can totally be customized to fit your space. 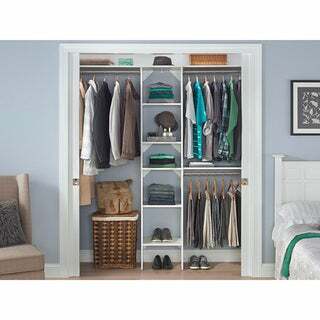 This particular configuration is designed for closets from 4 to 6 feet wide. Of course, you can get larger systems, too. 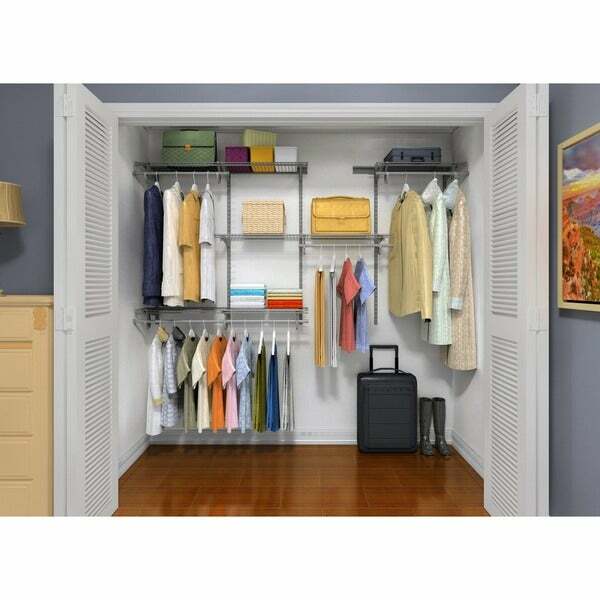 If you have a big walk-in closet (unlikely in a small space but not unheard of), Overstock.com has so many great closet systems and organizers you’ll find exactly what you’re looking for. Some systems have drawers, shelves, and rods in many configurations. There’s an installation guide with all of the options. Some additional options include shoe racks and corner shelves…you name it. In my guest room, I’ve got a hanging shoe organizer and a hanging shelf organizer. It’s great because I don’t have a chest or dresser in that room but when my company comes, they can still unpack their suitcases and make themselves at home! The point is, you can make this work whatever your situation. It’s affordable and has so many good reviews. 4 Creative Cluttering Tips for 2019 is another post you’ll want to check out. It’s my first post of 2019. I would love to have your thoughts on these suggestions and any unique solutions that might be working for you, too. Thanks for stopping by and stay tuned!